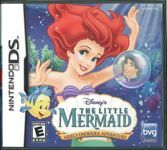 Platform game for the DS about Disney's Little Mermaid. The player controls Ariel through a variety of levels and puzzles. The game takes advantage of the DS microphone and stylus. Some challenges requires singing certain pitches or blowing on the microphone. Most of the game uses the stylus for control.